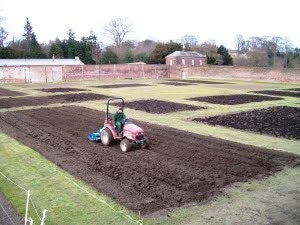 The Gardens team are now busy at work on the new vegetable beds in the Walled Garden at Harewood. This new kitchen garden is very much a team project with the Gardeners, Catering staff and Volunteers all working together to make the Harewood plot-to-plate plan a reality. The Walled Garden at Harewood will revive the tradition of growing food on site to support the House and Estate and as part of our continuing support of local growers, reducing food miles and home-grown produce these new vegetable beds will supply both the Courtyard Shop and Café – so you’ll be seeing the food grown here on the menu in the café too! As you can see from the pictures, the new beds are huge, much bigger than even the Gardeners had envisaged when they marked them out. Muck-spreading is the first job with sowing taking place late March to early June – parsnips, beetroot, carrots, potatoes, cabbages; many of which are new varieties for 2010. Next time you visit, take a stroll around the lakeside to the Walled Garden and see how work is progressing! We’ll keep you posted with developments, just sign up to follow our blog! Posted 19 April 2010 at 12.37pm by Hospitality Team. Filed under: Uncategorized. Tagged: Uncategorized. On Thursday the sales team went off to the Yorkshire Conference and Hospitality Show at Savilles near the Royal Armouries. It was the first time in a ages that we’ve been to a corporate exhibition. Our new stand, which had been put together at a rapid rate of knots by the amazing Beck Marriott, was a roaring success. We attracted 15% of the total visitors to the show on the day. Among the many attractions to our stand were the delicious mulled wine and mince pies, prepared by our fantastic hospitality team. Yes it was a bit early for mince pies but there was method in this madness. We were launching our Christmas party options and working on developing awareness of Harewood as a Christmas party venue. Here is a short video of the stand. It was videoed using a mobile phone so the quality is fairly low. On Friday we hosted 20 Conference buyers, from Conference Leeds, to lunch and a show around. A great bunch they were too. Fortunately the sun shone as we showed them our new Pavilion which will hold over a 1000 theatre style when it has been completed. Maggie Mash and Sue Sharpe provided us with an excellent tour of the State Floor and highlighted that the House has always been used for business as well as pleasure. To end the lunch we asked for a volunteer. We didn’t say what they were volunteering for. But Rachel was very overexcited when we told her it was to feed our penguins. This is just the start of Harewood’s drive to be the best conference venue in Leeds. Posted 21 March 2010 at 3.40pm by Hospitality Team. Filed under: Notes. Tagged: art exhibition, conference, corporate hospitality, Leeds, sales team. Harewood has opened for half term, the weather has been cold, sometimes clear, sometimes wet! However there has been lots going on. One of the most popular activities has been the felt puppet making of tiger puppets to celebrate the Chinese year of the Tiger. 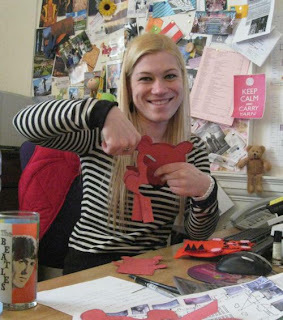 in fact it has been so popular that Jennifer Auty, one of our Learning and Access Officers (she provides fabulous ideas for school trips) has had to go an buy more felt for the puppets twice! Here she is making a prototype puppet. Today is Shrove Tuesday or now more popularly known as Pancake Day. It has been a spectacular success today with a huge number of families coming to see the demonstrations and get some ideas for their own pancakes. The pancake tossing was particularly popular. This year we will be doing a lot more food demonstrations in the Old Kitchen. Posted 16 February 2010 at 4.37pm by Hospitality Team. Filed under: Uncategorized. 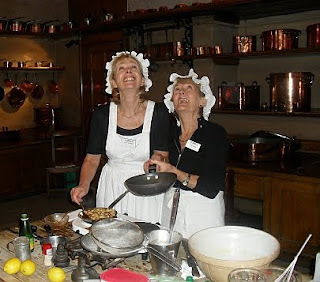 Tagged: Harewood House, Leeds, Old Kitchen, school trips, Shrove Tuesday, Yorkshire. 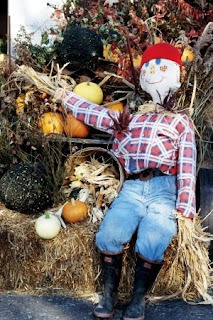 Autumn Glory Fun and Scarecrows! Autumn Glory has been a great success with the most glorious array of Autumn colour we have seen in years. Harewood’s grounds look beautiful at this time of year and it’s also a great opportunity to get the family out of the house this half term! The event is only halfway through so there’s plentry more half term activities and family fun still to come. The weather forcast for the next few days is great so why not come along and explore Harewood this Autumn! 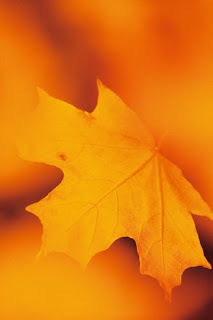 You can upload your own Autumn Glory images and snaps to our Facebook site…please do so as we’d love to see them! Posted 28 October 2009 at 1.02pm by Hospitality Team. Filed under: Uncategorized. Tagged: autumn, half term activites, Harewood House. Autumn Glory is set to be spectacular this year with good weather promised and the leaves turning red and gold as we speak! Different activities and entertainments every day, for a full programme please visit the website. You can Book Now on our website! Harewood is a great place for family days out take a look on the website, pay us a visit and see why! Posted 15 October 2009 at 2.49pm by Hospitality Team. Filed under: Uncategorized. Tagged: autumn, half term activites, Harewood House.